To be honest, up until this album from Blackwelder, I have never heard of guitarist Andrew Szucs nor his previous band Seven Seraphim. The band cut one album, Believe In Angels in 2103: that's 12 years ago. I doubt anybody remembers it. 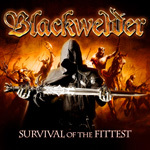 As press information goes, the material within Blackwelder's Survival of the Fittest was intended to be the second Seven Seraphim album. It seems Szucs thought better of the situation and opted to start with a fresh band. He's got Bjorn Englen on bass (Dio Disciples, ex-Yngwie Malmsteen) and Aquiles Priester on drums (Primal Fear, Hangar, ex-Angra), with Germany's premier metal vocalist Ralf Scheepers on vocals. How an unknown guitar pulled off this magic act is beyond me. So the first question that came to mind, and maybe to yours too, upon seeing Ralf Scheepers on the mic, Is this album going to sound like Primal Fear? You can't dismiss the power and tone that his voice adds to the current Primal Fear sound. But Blackwelder does not sound like Primal Fear. Mostly, this is because Scheeper's performance is basically a non-event across this album, barely heard and pummeled in the mix mostly by the guitar line, followed by the rhythm section. Best scenario for him is the first song The Night of New Moon. I'm hoping Ralf quickly cashed his paycheck for this gig, because I'm not sure there's much of a future for him with Blackwelder (or subsequent residuals). After this, and fundamentally, Survival of the Fittest is an Andrew Szucs guitar driven power metal album. That's all folks. But then again, as you listen there's no doubting his significant talent. Szucs can move between a straight metal style and neo-classical fret board frenzy with ease. Though most everything here seems more the latter case. And because this album swerves more towards the guitar, it's hard say that anything is song centric. Not that there isn't some melody or harmony, or some lyrical hooks. But they're not the point; the guitar is. I'm one of those guitar geeks: love the lead guitar, riffs and solos, everything. But this is way over the top and really never took hold for me. You might as well line up some Malmsteen or Impellitteri albums and knock them down like so many dominoes as you listen to the same thing over and over again. All this makes wonder what the Seven Seraphim stuff sounded like. But I'll move on.